I told you once about my Friday guilty pleasures, and how they usually involved some kind of fried hangover cure. Well, today is no different. I mean today is Friday, isn’t it? I am making a Bite-Sized declaration: Friday will now, and forever, be known as Fry-day. I’m really a sucker for anything fried, but grilled cheese has a special place in my heart, obviously. So, when I got an email that the Gorilla Cheese Truck was downstairs, I immediately made a mad dash for the door. If that’s not a sign from the food gods, I don’t know what is. At first, the name baffled me. Why Gorilla? And then, it hit me…if you say Gorilla Cheese quickly it starts to sound like “Grilla Cheese” and that my friend is deliciously clever. Oh the joys of being a blonde and not getting jokes right away. One thing that never escapes this Bite-Sized Blonde is good food, and that’s exactly what I got at from the Gorilla Cheese Truck. So many options. I wanted them all, but my eyes really are bigger than my stomach. And since I want to keep it that way, I kept my ordering to a minimum. 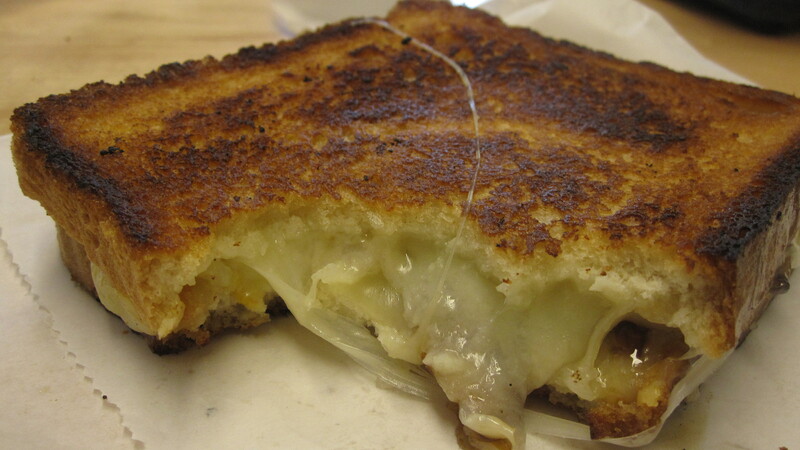 There was a bevy of sandwiches, and other fried specialities, to chose from, just like any other grilled cheese shop. But what really caught my eye were the unique sauces and toppings to chose from. So, I created my own sandwich. Gruyere, Munster and Carmelized onions. This little creation of mine was inspiried by french onion soup. And it was seriously awesome. So awesome in fact, that I think Gorilla Cheese Truck should put it on their menu full time. I also think it should be called the Bite-Sized Banter. Just sayin. I couldn’t resist the Mac N Cheese bites. These little triangular nibbles are nothing short indulgent. 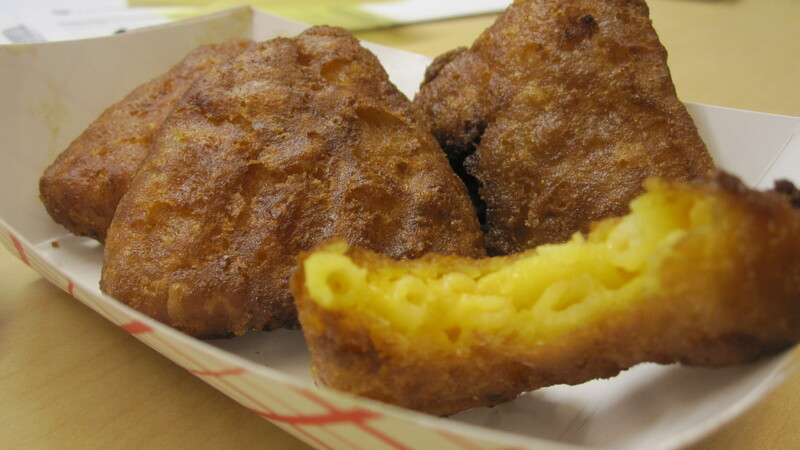 I wonder how the mac n’ cheese stays creamy, while the outside is crispy? I guess I’ll just have to do a little more research on those. So if you are in the need for something fried, because your brain is fried, then I suggest you also make a mad dash for the Gorilla Cheese Truck. And if you order my signature sandwich, don’t forget to mention how you think it should be named for me. This entry was posted in Food Truck and tagged American, Cheese, Sandwich. Bookmark the permalink. I used to be very pleased to seek out this internet-site.I wanted to thanks for your time for this glorious read!! I definitely enjoying each little bit of it and I have you bookmarked to check out new stuff you blog post. I’m glad you are enjoying my blog! Come back and see me soon!